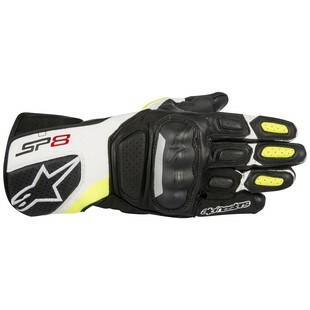 The new SP-8 v2 is Alpinestars entry level full gauntlet glove coming in at $99.95. It has high-end features and looks without the high-end price. The Alpinestars SP-8 v2 Gloves feature premium, full-grain leather construction, as well as a new microfiber PU grip insert positioned on the palm and thumb. The glove also incorporates new premium quality suede on the palm. I really like the perforated finger sidewalls as full gauntlet gloves can get very hot on the race track. The gloves are also touch screen compatible with is a great feature. These gloves will be great for a new track rider or some who just wants high-end protection for the street. I am sure these gloves will be very popular this spring and will a great addition to anyone's gear closet.